Earnings season is in full swing—no fewer than 23 companies announced dividend increases in the past week. I monitor dividend increases for stocks on my watch list of dividend growth stocks to identify candidates for further analysis. Companies can only raise their dividends regularly and sustainably if they grow earnings sufficiently. Part 1 covers dividend increases from the Financials and Real Estate Sectors. Part 2 will cover dividend increases for the remaining sectors. Of the 12 stocks I'm covering in Part 1, five announced double-digit percentage increases! The top increase is from TD Ameritrade Holding (AMTD), a subsidiary of The Toronto-Dominion Bank, which provides securities brokerage services and related technology-based financial services. AMTD announced a spectacular increase of 43% and now yields 2.39% at $50.17 per share. To see details of these the increases announced by stocks in the Financials and Real Estate sectors, please read this article at Seeking Alpha. As a bonus, I'm including a summary of ex-dividend dates for the next two weeks. Scan the list of stocks to see if there's a stock you want to pick up before the ex-dividend date so you can grab the next dividend. Thanks for reading! Please subscribe to receive an e-mail whenever I post new articles. 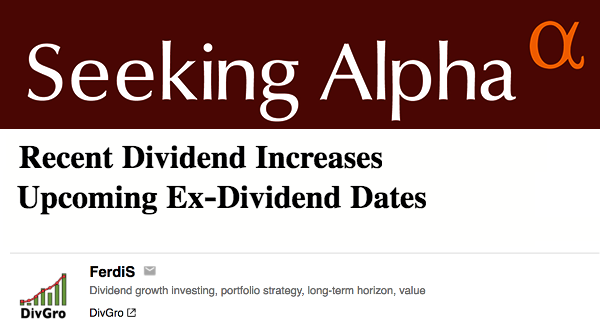 Feel free to leave a comment on this article either here or at Seeking Alpha. I'll do my best to respond to each comment as quickly as possible. Please don't include irrelevant links in comments. I will mark such comments as spam and the comment won't be published. To make me aware of your blog or website, comment on my Blogrole page instead. I'm an effects artist at a well-known animation studio in the Bay Area. I invest in stocks and options to generate passive income. 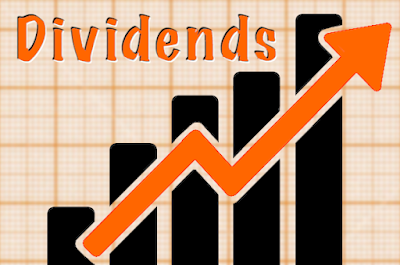 On this blog, I write about my portfolio of dividend growth stocks, DivGro, created in January 2013. My goal is to generate a reliable and growing dividend income stream. I use options to boost dividend income. 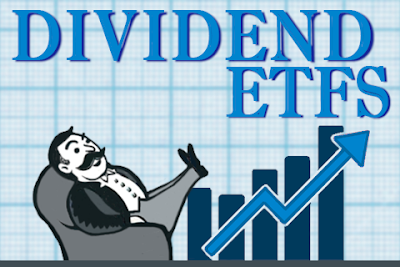 Simply Safe Dividends provides dividend safety scores, a portfolio analyzer, and charts of financials. finbox.io provides a suite of online investing tools that makes it faster and easier to find undervalued stocks. I've been a Seeking Alpha contributor since 2014. My Seeking Alpha articles are linked from my profile page. I started writing for TalkMarkets in 2019. My TalkMarket articles are linked from my profile page. The DIV-Net and I republish those articles one week later here at DivGro. DividendStocks.Cash uses the correlation growth model to identify stocks likely to outperform the market. Smarter Dividends provides advanced portfolio tracking and time machine backtesting for US-traded stocks. Dividend Stocks Rock provides various tools and model portfolios for investors wanting to manage their own portfolio. Simply Wall St gives investors access to institutional quality data and analysis reports presented visually. Born To Sell offers a covered call screener and portfolio management software to track covered calls. We are millionaires once again, but how long will this last? Early Jobs 3 – Who’s Using Who? $25B great performing monster stock that almost no one ever talks about. 51 Crude Oil ETFs & ETNs. Some Will Make You Happy. Copyright © FerdiS, DivGro 2013-2019. All rights reserved. Powered by Blogger.